The present invention provides novels genes encoding methyl butenol (MBO) synthase, methy butenol synthases and their use in methyl butenol production. This application is a U.S. National Stage Filing under 35 U.S.C. 371 from International Application No. PCT/US2010/035820, filed May 21, 2010 and published in English as WO 2010/135674 on Nov. 25, 2010, and claims priority from U.S. Provisional Application Ser. No. 61/180,757 filed May 22, 2009, which applications are herein incorporated by reference in their entireties. This work was funded by NSF Grant No. IOS 0830225. The government has certain rights to this invention. In 2007, there were 1.8 million alternative fuel vehicles sold in the United States, indicating an increasing popularity of alternative fuels. There is growing perceived economic and political need for the development of alternative fuel sources due to general environmental, economic, and geopolitical concerns of sustainability. The major environmental concern is that most of the observed increase in globally averaged temperatures since the mid-20th century is due to the observed increase in greenhouse gas concentrations. Since burning fossil fuels is known to increase greenhouse gas concentrations in the atmosphere, it is believed that they are a likely contributor to global warming. Although fossil fuels have become the dominant energy resource for the modern world, alcohol has been used as a fuel throughout history. The first four aliphatic alcohols (methanol, ethanol, propanol, and butanol) are of interest as fuels because they can be synthesized and they have characteristics which allow them to be used in current engines. Biobutanol has an energy density that is closer to gasoline than the other alcohols; however, this advantage is outweighed by disadvantages (compared to ethanol and methanol) concerning, for example, production. The present invention provides for the first time genes encoding methyl butenol (MBO) synthase and its use in methyl butenol production. Thus, one embodiment provides an isolated and purified methyl butenol (MBO) synthase nucleic acid molecule, wherein the MBO synthase nucleic acid molecule comprises any one of SEQ ID NOs:1-17 or a nucleic acid molecule having at least about 80% sequence identity thereof. Another embodiment provides an expression vector comprising a MBO synthase nucleic acid molecule. One embodiment provides a prokaryotic or eukaryotic host cell transformed with a MBO synthase nucleic acid molecule (e.g., in an expression vector). In one embodiment the transformed host cells express the exogenous MBO synthase (mRNA or protein). In one embodiment, the host cells express MBO synthase and yield MBO. One embodiment provides an isolated and purified methyl butenol (MBO) synthase polypeptide, wherein the MBO synthase polypeptide comprises any one of SEQ ID NOs:18-34 or a bioactive polypeptide having at least about 80% sequence identity thereof. Another embodiment provides a method to produce methyl butenol comprising transforming a host cell with a nucleic acid molecule coding for a methyl butenol synthase and expressing said molecule in a host cell so as to yield methyl butenol. In one embodiment, the hose cells are fermentative organisms, such as a bacteria, cyanobacteria or yeast (e.g., a bacteria or yeast that can break down sugar into alcohol) or eukaryotic micro algae. In one embodiment the fermentative organism is Saccharomyces cerevisiae, Klebsiella oxytoca, Synechococcus sp., Synechocystis sp., Anabaena sp., Chlorella sp. Scenedesmus sp., Bracteococcus sp. Chlamydomonus sp., C5- or C6-fermentative organisms (including Zymomonas (e.g., Zymomonas mobilis)) or a combination thereof. In one embodiment, the transformed host cell is used in fermentation with a carbohydrate to yield MBO (similar to bioethanol production). In one embodiment, the MBO synthase (in a purified or unpurified form) is used in combination with a carbohydrate to yield MBO. In one embodiment, the fermentative organism is bacteria, cyanobacteria or yeast (e.g., a bacteria or yeast that can break down sugar into alcohol) or eukaryotic micro algae. In one embodiment the fermentative organism is Saccharomyces cerevisiae, Klebsiella oxytoca, Synechococcus sp., Synechocystis sp., Anabaena sp., Chlorella sp. Scenedesmus sp., Bracteococcus sp. Chlamydomonus sp., C5- or C6-fermentative organisms (including Zymomonas (e.g., Zymomonas mobilis)) or combinations thereof. FIG. 1 provides nucleic acid molecules coding for a methyl butenol synthase (SEQ ID NOs:1-17). FIG. 2 provides the sequence of several methyl butenol synthases. (SEQ ID NO:18-34). FIGS. 3A-B demonstrate the methylbutenol and isoprene production from soluble and insoluble extract fractions. FIG. 4 demonstrates the effect of boiling and EDTA on enzyme activity. FIG. 5 demonstrates the effect of co-factor replacement on MBO synthase activity. The present invention provides for the first time genes encoding methyl butenol (MBO) synthase and its use in methyl butenol production. In particular, the methyl butenol synthase gene was isolated from several species of pine. The gene is useful for the enzymatic production of methyl butenol, which can be used as an alternative fuel (e.g., a biofuel or gasoline replacement). Thus, the methods provided herein provide a practical, non-polluting technology for producing methyl butenol using methyl butenol synthase proteins and genes. Exemplary cDNA sequences coding for methyl butenol synthases are provided in SEQ ID NOs:1-17, while exemplary amino acids sequences are provided in SEQ ID NOs:18-34 (see FIGS. 1 and 2). Biosynthesis of MBO occurs in the chloroplast through the action of the enzyme MBO synthase, which uses DMADP derived from the MEP pathway as a substrate. “Associated with/operably linked” refers to two DNA sequences that are related physically or functionally. For example, a promoter or regulatory DNA sequence is said to be “associated with” a DNA sequence that codes for an RNA or a protein if the two sequences are operably linked, or situated such that the regulator DNA sequence will affect the expression level of the coding or structural DNA sequence. “Coding DNA sequence:” refers to a DNA sequence that is translated in an organism to produce a protein. “Expression” of a sequence includes the production of mRNA and/or protein. “Isolated,” in the context of the present invention, an isolated nucleic acid molecule or an isolated polypeptide is a nucleic acid molecule or polypeptide that, by the hand of man, exists apart from its native environment and is therefore not a product of nature. Thus, the term isolated refers to a molecule (e.g., nucleic acid or protein) which is not associated with one or more nucleic acid molecules, proteins or one or more cellular components that are associated with the nucleic acid molecule or protein in vivo. An isolated nucleic acid molecule or an isolated protein may exist in a purified form (e.g., ranges of purity in samples comprising isolated nucleic acid molecules or an isolated protein are 50-55%, 55-60%, 60-65% and 60-70%; ranges of purity also include 70-75%, 75-80%, 80-85%; 85-90%, 90-95%, and 95-100%; however, samples with lower purity can also be useful, such as about <25%, 25-30%, 30-35%, 35-40%, 40-45% and 45-50%.) or may exist in a non-native environment such as, for example, a transgenic host cell. A “cell” or “host cell” is a prokaryotic or eukaryotic cell. Alternative fuels, also known as non-conventional fuels, are any materials or substances that can be used as fuels, other than conventional fuels. Conventional fuels include: fossil fuels (petroleum (oil), coal, propane, and natural gas), and nuclear materials such as uranium. Some well known alternative fuels include biodiesel, bioalcohol (methanol, ethanol, butanol), chemically stored electricity (batteries and fuel cells), hydrogen, non-fossil methane, non-fossil natural gas, vegetable oil and other biomass sources. For example, one alternative is alcohol fuel. Alcohol fuels are usually of biological rather than petroleum sources. When obtained from biological sources, they are known as bioalcohols (e.g. bioethanol). 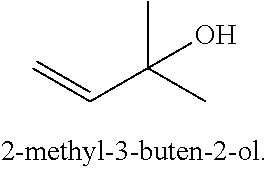 As described herein 2-methyl-3-butene-2-ol (methyl butenol) can be manufactured in organisms carrying a synthase gene of the invention or by fermentative organisms in contact with a synthase protein of the invention and a carbohydrate source. It is a sustainable energy resource that can provide a more environmentally and economically friendly alternative to fossil fuels such as diesel and gasoline. It can be combined with gasoline at different percentages, or can be used in its pure form. Generally, methyl butenol is more advantageous than ethanol as a fuel due to its increased density and relatively little or no water absorption as with ethanol. Unlike butanol, the presence of a branched carbon chain increases its octane rating and the presence of a double carbon-carbon bond can reduce toxicity. The terms “comprises,” “comprising,” and the like can have the meaning ascribed to them in U.S. Patent Law and can mean “includes,” “including” and the like. As used herein, “including” or “includes” or the like means including, without limitation. Provided herein are methyl butenol synthase genes including those of SEQ ID NOs: 1-17 or a nucleic acid molecule which comprises a sequence that has at least about 50%, at least about 60%, at least about 70%, about 71%, about 72%, about 73%, about 74%, about 75%, about 76%, about 77%, about 78%, or about 79%, or at least about 80%, about 81%, about 82%, about 83%, about 84%, about 85%, about 86%, about 87%, about 88%, or about 89%, or at least about 90%, about 91%, about 92%, about 93%, or about 94%, or at least about 95%, about 96%, about 97%, about 98%, about 99%, or about 100% sequence identity compared to any one of SEQ ID NOs:1-17 using one of the alignment programs available in the art using standard parameters. Also provided herein are methyl butenol synthase proteins including those of SEQ ID NOs:18-34 or a polypeptide which comprises a sequence that has at least about 50%, at least about 60%, at least about 70%, about 71%, about 72%, about 73%, about 74%, about 75%, about 76%, about 77%, about 78%, or about 79%, or at least about 80%, about 81%, about 82%, about 83%, about 84%, about 85%, about 86%, about 87%, about 88%, or about 89%, or at least about 90%, about 91%, about 92%, about 93%, or about 94%, or at least about 95%, about 96%, about 97%, about 98%, about 99%, or about 100% sequence identity compared to any one of SEQ ID NOs:18-34 using one of the alignment programs available in the art using standard parameters. In one embodiment, the differences in sequence are due to conservative amino acid changes. In one embodiment, the functional properties of the enzyme are improved through the use of molecular evolution and design studies. Methods of alignment of sequences for comparison are available in the art. Thus, the determination of percent identity between any two sequences can be accomplished using a mathematical algorithm. Computer implementations of these mathematical algorithms can be utilized for comparison of sequences to determine sequence identity. Such implementations include, but are not limited to: CLUSTAL in the PC/Gene program (available from Intelligenetics, Mountain View, Calif.); the ALIGN program (Version 2.0) and GAP, BESTFIT, BLAST, FASTA, and TFASTA in the Wisconsin Genetics Software Package, Version 8 (available from Genetics Computer Group (GCG), 575 Science Drive, Madison, Wis., USA). Alignments using these programs can be performed using the default parameters. Methyl butenol synthase can be introduced into any number of organisms to cause them to produce methyl butenol synthase and/or methyl butenol. For example, the genes can be cloned into appropriate expression vectors and expressed in bacteria or yeast. The creation of expression vectors comprising the nucleic acid molecules of the invention and bacterial and yeast transformation techniques are described in detail in the literature and available to an art worker. Typically an expression vector contains (1) prokaryotic DNA elements coding for a bacterial replication origin and an antibiotic resistance gene to provide for the amplification and selection of the expression vector in a bacterial host or DNA elements to allow expression in a eukaryotic host cell (e.g., yeast); (2) regulatory elements that control initiation of transcription such as a promoter; and (3) DNA elements that control the processing of transcripts such as introns, transcription termination/polyadenylation sequence. Methods to introduce a nucleic acid molecule into a vector are well known in the art (Sambrook et al., 1989). As an example, a vector into which the nucleic acid segment is to be inserted is treated with one or more restriction enzymes (restriction endonuclease) to produce a linearized vector having a blunt end, a “sticky” end with a 5′ or a 3′ overhang, or any combination thereof. The vector may also be treated with a restriction enzyme and subsequently treated with another modifying enzyme, such as a polymerase, an exonuclease, a phosphatase or a kinase, to create a linearized vector that has characteristics useful for ligation of a nucleic acid molecule into the vector. The nucleic acid molecule that is to be inserted into the vector is treated with one or more restriction enzymes to create a linearized segment having a blunt end, a “sticky” end with a 5′ or a 3′ overhang, or any combination thereof. The nucleic acid molecule may also be treated with a restriction enzyme and subsequently treated with another DNA modifying enzyme. Such DNA modifying enzymes include, but are not limited to, polymerase, exonuclease, phosphatase or a kinase, to create a polynucleic acid segment that has characteristics useful for ligation of a nucleic acid molecule into the vector. The treated vector and nucleic acid molecule are then ligated together to form a construct containing a nucleic acid segment according to methods known in the art (Sambrook, 2002). Briefly, the treated nucleic acid molecule and the treated vector are combined in the presence of a suitable buffer and ligase. The mixture is then incubated under appropriate conditions to allow the ligase to ligate the nucleic acid molecule into the vector. An example of the preparation of an expression vector and expression of MBO synthase in an organism is described in the examples below. However, any expression vector and organism combination for expression available to an art worker may be acceptable for use in the methods of the invention. It will be clear to one of ordinary skill in the art which vector should be used depending on which cell type is used for a host cell. Alternatively, the methyl butenol synthases of the invention can also be chemically synthesized through peptide synthesis procedures available to the art. The free enzyme can be contacted with an appropriate substrate (a source of carbohydrate) to produced methyl butenol (with our without the use of a host cell). After preparation of the expression vector and introduction into an appropriate host cell, the cells can be grown in culture to produce methyl butenol synthase and/or methyl butenol, which can be collected (and optionally distilled or condensed). Alternatively, the culture can be used to produce the free enzyme which is then used to produce MBO. For example, a source of carbohydrate (e.g., sugars (e.g., CnH2nOn (n is between 3 and 7), including a monosaccharide (e.g., glucose, dextrose or fructose) or a disaccharide (e.g., sucrose), starches (e.g., a carbohydrate consisting of a large number of glucose units joined together by glycosidic bonds, such as amylase or amylopectin) and/or cellulose (e.g., an organic compound with the formula (C6H10O5)n, a polysaccharide consisting of a linear chain of several hundred to over ten thousand β(1→4) linked D-glucose units)) and a methyl butenol (MBO) synthase of the invention can be combined to yield MBO, which can be purified further (e.g., distilled or condensed from the head space). The MBO produced by the methods of the invention can be used as an alternative fuel source. The following examples are provided in order to demonstrate and further illustrate certain embodiments and aspects of the present invention and is not to be construed as limiting the scope thereof. Total RNA was extracted from frozen pine needle tissue from Pinus sabiniana using a modified CTAB procedure adapted from (Chang et al. (1993) Plant Molecular Biology Reporter, 11(2):113-116.). Needle samples (250 mg) were ground under liquid nitrogen, and extracted for 45 minutes at 70° C. in 800 u1 volumes of extraction buffer containing 2% CTAB, 2% PVP-40, 100 mM Tris pH8.0, 25 mM EDTA, 2.0M NaCl, and 0.5 g/L Spermidine with 4% β-mercaptoethanol, 4% PVPP, and an additional 4% PVP40 was added just before use. Following incubation at 70° C. for 45 minutes, samples were extracted twice with 5000 volumes of 24:1 (v:v) chloroform:isoamyl alcohol solution. RNA was then precipitated by adding ¼ volume of 10M LiCl to the aqueous phase, gently mixing, and storing the mixture overnight at 4° C. Following centrifugation to collect the RNA pellet, the supernatant was discarded and the pellet was re-suspended in 500 μl of SSTE Buffer containing 1.0M NaCl, 0.5% SDS, 10 mM Tris pH8.0, and 1 mM EDTA. This solution was then extracted once with equal volumes of phenol, once with phenol:chloroform:IAA (24:24:1 v/v), and once with chloroform:IAA (24:1 v/v). To precipitate the RNA pellet, 2 volumes of cold (−20° C.) ethanol were added to the supernatant followed by incubation for 2 hours at −20° C. Following centrifugation to collect the pellet, the RNA was air dried, re-suspended in distilled water, and stored at −20 C until further use. First strand cDNA synthesis was performed using M-MLV reverse transcriptase obtained from Invitrogen (Carlsbad, Calif.) following the manufacturers instructions. Total RNA (2 μg), and 1 μg oligo-dT(17) primer were denatured by incubation at 70° C. for 5 minutes, and then placed on ice for 5 min to anneal the oligo-dT primer to the mRNA polyA tail. Reagents were added to this mixture to achieve a 50 μL volume containing 1× concentration M-MLV buffer, 0.5 mM dNTPs, 0.1M DTT and 2.5 units of RNasin (Promega, Madison Wis.). The first strand synthesis reactions were performed by incubating for 60 min at 37° C., followed by incubating for 10 min at 42° C., and heat inactivation of the enzyme by incubating at 70° C. for 15 min. Reactions were cooled on ice and stored at −20° C. until further use. Initially, degenerate PCR primers were designed to correspond to highly conserved regions of known pine monoterpene synthases. Sequencing of the PCR amplified products revealed 3 distinct sequences which showed high similarity to known pine monoterpene synthases. One sequence contained a phenylalanine residue 7 amino acids upstream of the highly conserved DDXXD motif of terpene synthases. Since this position corresponds to the location of a phenylalanine residue in isoprene synthases and is believed to limit the size of the substrate that can fit into the enzymes active site, this phenylalanine containing sequence was selected for further exploration. To obtain the 5′ and 3′ ends of this sequence 5′ and 3′ rapid amplification of cDNA ends (RACE) was employed. For these procedures gene specific forward and reverse primers were designed from the previously selected partial MBO synthase sequence. Initial PCR reactions were run using 1.25 units of Gotaq DNA polymerase in 30 μl reaction volumes containing 1× Gotaq buffer, 20 μM dNTPs, 1 μM concentrations of each primer, and 0.2 μg template cDNA. In preparation for cloning, full length cDNAs were amplified using either Pfu turbo (Stratagene, La Jolla Calif.) or Platinum Pfx (Invitrogen, Carlsbad Calif.) DNA polymerases according to the manufacturer instructions. To amplify full length cDNAs PCR reactions were run using an initial denaturation of 2 min at 95° C., followed by 35 repetitions of denaturation at 95° C. for 30 sec, annealing at 52° C. for 45 sec, and extension at 72° C. for 3 min, followed by a final extension at 72° C. for 9 min. Rapid amplification of cDNA ends (RACE) procedures were employed to amplify the 5′ and 3′ ends of the partial MBO sequence obtained using degenerate primers. RACE reactions were run using 1.25 units of Gotaq DNA polymerase in 30 μl reaction volumes containing 1× Gotaq buffer, 20 μM dNTPs, 1 μM concentrations of each primer (gene specific, adapter, oligo dt-adapter), and 0.2 μg template cDNA. The full length amino acid sequence of the MBO synthase gene contains an N-terminal region similar to the plastid transport sequences found in known conifer monoterpene synthases. These transport sequences have been found to interfere with protein expression in E. coli (Williams et al. (1998) Biochemistry, (37):12213-12220), hence primers were designed to amplify a fragment of the putative MBO synthase gene lacking this chloroplast transport sequence. Hereafter this will be referred to as an expression length sequence. Expression length sequences were first ligated into the vector p-GEMT easy (Promega, Madison Wis.) and transformed into the E. coli host strain DH5α. pGEMT-easy plasmids containing the MBO synthase gene (pGEMT-MBO) were extracted from the DH5α host and digested with the restriction enzymes SphI and PstI to release an ˜1800 bp fragment containing the MBO synthase gene with a 5′ SphI and 3′ PstI splice site. This fragment was then gel purified and ligated into the expression vector pQE-31 (Qiagen) following digestion of pQE-31 vector with the restriction enzymes SphI and PstI and gel purification of the 3.4 kb digested product. Gel purification of restriction digests was done using a Qiagen gel purification kit (Qiagen). Following ligation of the expression length MBO sequence into the expression vector pQE-31, pQE-31-MBO was transformed into E. coli strain BL21-CodonPlus(DE3)-RIL (Stratagene, La Jolla Calif.). This strain of E. coli has been modified to correct for codon bias by increasing the expression of several t-RNAs that match codons that are common in plant terpene synthases, but rare in E. coli. The MBO synthase gene contains several codons for which t-RNAs in E. coli are rare. E. coli BL21-Codon Plus(DE3)-RIL containing expression plasmid pQE-31-MBO were grown overnight at 37° C. with shaking at 200 rpm in 5 ml Luri Broth supplemented with 200 μg/ml ampicillin and 34 μg/ml chloramphenicol. Aliquots of bacterial culture (0.5 ml) were placed into 5 ml vials and protein expression induced by adding 0.5 mM IPTG. Vials were capped with a septum and incubated at 30° C. with shaking at 200 rpm for 2 hours before analysis of headspace volatiles by gas chromatography. To measure methyl butenol in vial headspace, 3 ml aliquots of headspace were withdrawn from the vial and cryofocused by injection into a stainless steel sample loop immersed in liquid nitrogen. The cryofocused sample was then flash vaporized by immersing the sample loop in warm water and flushed onto a widebore capillary DB-1 GC column, 30 m length, 0.32 mm ID, 5 micron film (JW Scientific, Folsom, Calif.) using flow of Helium carrier gas, and analyzed using a Photoionization detector. Component separation was achieved using a temperature program of 30° C. for 10 minutes, followed by a temperature ramp of 2° C. per minute and a hold at 60° C. for 5 minutes. The identity of methylbutenol measured in vial headspace was assessed by comparison of GC peak retention times with those obtained from authentic MBO standards, and by GC-mass spectrometry. The below assays were run at pH 8.0 in a 50 mM Hepes buffer with 10% glycerol, 100 mM KCl, 20 mM MgCl2, 5 mM MnCl2, and 10 mM DMAPP. Assays were incubated for 2 hours at 37° C., and vial headspace was run on GC. Products were identified by comparing retention times with authentic standards. FIG. 3 demonstrates that expressed enzyme (with both N and C-terminal His tags (for purification) possess dual catalytic activity and can form both isoprene and methylbutenal from the substrate DMAPP (dimethylallyl pyrophosphate (or -diphosphate)). The enzyme partitions to the insoluble fraction during the extraction process. FIG. 4 demonstrates that most of the activity is in the insoluble fraction. Furthermore, experiments determined that the conversion of DMAPP to isoprene and MBO is the result of the MBO synthase. For example, assays run with a boiled pellet (the most active extract) show little or no production of isoprene or MBO. Thus, boiling the extract inactivated the enzyme responsible for DMAPP conversion. Also, assays run with active enzyme in the presence of EDTA show little conversion of DMAPP to isoprene or MBO. This is significant because MBO synthase requires a divalent cation to function. EDTA chelates these cations and thus eliminated enzyme function. FIG. 5 demonstrates the effect of selectively removing the cation co-factors for MBO synthase function. The plant extract MBO synthase uses both Mn2+ and K+ as co-factors. Angiosperm isoprene synthases uses Mg2+. By washing the pellet containing the recombinant MBO synthase protein extracted from E. coli, the Mn2+ and K+ ions were removed. The pellets were then resuspended in isoprene synthase buffer contaning Mg2+ or MBO synthase buffer containing Mn2+ and K. Assays run in isoprene synthase buffer (without Mn2+ and K+ cofactors) show little activity. Assays run in MBO synthase buffer (with both Mn2+ and K+) show activity producing isoprene and MBO with about 3 fold preference for forming MBO. Thus, the catalytic activity observed is from an MBO synthase (e.g., the cloned gene). All publications, patents and patent applications are incorporated herein by reference. While in the foregoing specification this invention has been described in relation to certain preferred embodiments thereof, and many details have been set forth for purposes of illustration, it will be apparent to those skilled in the art that the invention is susceptible to additional embodiments and that certain of the details described herein may be varied considerably without departing from the basic principles of the invention. 1. An isolated and purified methyl butenol (MBO) synthase cDNA molecule, wherein the MBO synthase cDNA molecule comprises SEQ ID NO:8 or a nucleic acid molecule having at least 90% sequence identity thereof. 2. An expression vector comprising a MBO synthase cDNA molecule of claim 1. 3. An isolated prokaryotic or eukaryotic host cell transformed with a MBO synthase cDNA molecule of claim 1. 4. A prokaryotic or eukaryotic host cell transformed with the vector of claim 2. 5. The host cell of claim 3, wherein the transformed cell expresses MBO synthase. 6. A method to produce methyl butenol comprising transforming a host cell with a cDNA molecule of claim 1 and expressing said molecule in a host cell so as to yield methyl butenol. 7. The method of claim 6, wherein said host cell is a strain of yeast, bacteria, cyanobacteria, eukaryotic micro algae or a combination thereof. 8. The method of claim 7, wherein said yeast is Saccharomyces cerevisiae. 9. The method of claim 7, wherein said bacteria is a C5- or C6-fermentative organism. 10. The method of claim 9, wherein said C5-fermenative organism is a species of Zymomonas. 11. The method of claim 7, wherein said bacteria is Klebsiella oxytoca. 12. The method of claim 7, wherein said cyanobacteria is Synechococcus sp., Synechocystis sp., or Anabaena sp. 13. The method of claim 7, wherein said eukaryotic micro algae is Chlorella sp. Scenedesmus sp., Bracteococcus sp. or Chlamydomonus sp. 14. An isolated and purified methyl butenol (MBO) synthase cDNA, wherein the MBO synthase cDNA comprises SEQ ID NO:8. "International Application Serial No. PCT/US2010/35820, Invitation to Pay Additional Fee mailed Sep. 20, 2010", 4 pgs. "International Application Serial No. PCT/US2010/35820, Search Report mailed Mar. 7, 2011", 5 pgs. "International Application Serial No. PCT/US2010/35820, Written Opinion mailed Mar. 7, 2011", 5 pgs. 00195274, Picea sitchensis (-)-linalool-like synthase mRNA, complete cds. NCBI Nucleotide, Mar. 14, 2006 [online]. [Retrieved on Aug. 11, 2010]., Retrieved from the internet: 2 pgs. 00195274, Picea sitchensis (−)-linalool-like synthase mRNA, complete cds. NCBI Nucleotide, Mar. 14, 2006 [online]. [Retrieved on Aug. 11, 2010]., Retrieved from the internet: <URL: http://www.ncbi.nlm.nih.gov/nuccorel77454874> 2 pgs. Byun-McKay, et al., "Wound-Induced Terpene Synthase Gene Expression in Sitka Spruce That Exhibits Resistance or Susceptibility to Attack by the White Pine Weevil" 1009-1021, 2006. Demain, A. L, "The Business of Biotechnology", Indust, Biotechnol. ; vol. 3 (3), Especially p. 275, coil, para 4; col. 2, para 1., (2007), 269-283.